Need homemade Mother's Day gifts and ideas? We've rounded up these Mother's Day creations to warm every mom's heart! I'm sure any mom will say she's so lucky to have you! These thoughtful ideas will make her feel special on Mother's Day and will inspire her to keep going even through some really hard times. Continue reading for the full list of thoughtful homemade beautiful DIY gifts! Help your mom cope with another year of caring for the whole family with a DIY survival kit. This is one of the homemade Mother's Day gifts she can keep for her daily use. From breakfast in bed to choice of a chore, I'm sure any Mom would love to get this. It's a simple present she will take to heart. There's nothing better than a picture of you and mom in a DIY photo frame. It's always great to see a memory preserved for a lifetime. Let your mom relax in a soothing bath with this homemade sugar scrub. She deserves something sweet in her bathroom for this special day. Make a tote bag in two ways that she will want to use every day. This will serve as her partner in keeping things organized whenever she goes out during the day. This is a great gift idea the little kids can make. It's nothing too complicated for the children to create for dear mom. A bouquet of colorful handprints, what more can a mother ask for? Spoil your mom with some DIY bracelets she'll love to wear every day. This will definitely look great around her wrist. Just make sure it fits her style and mood. Give her a little something that will last forever. These lovely paper flowers will always remind her of how beautiful your family is when she's around. Does your mom have a necklace collection? Do you think she will love these wonderfully unique designs? Make a DIY necklace to add to her collection! You just can't imagine how much stress a mom gets in a day. Give her a de-stressing Mother's Day with this homemade foot soak. It's one of the homemade Mother's Day gifts that temporarily relaxes her from all her struggles and challenges! To even further help relieve mom's stress, throw in a DIY candle. You can even add her favorite fragrances as one of the ingredients to make it more personalized. A vase of fresh flowers with your picture in it? That's so special! It's one of the ultimate homemade Mother's Day gifts for your mom! Some last minute DIY Mother's Day gifts to make her happy. This mad libs poem generator is so adorable! You'll love filling it out, and she'll love reading it. Make these easy DIY soaps your mother will surely love. The combination of lavender and chamomile creates a wonderful scent that soothes her senses while she takes her shower. You can't always be around to give your mom a hug. So, give here these adorable DIY pillows for her everyday comfort. This is a gift idea the little ones can make. This will remind mom of her adorable baby being thoughtful on Mother's Day. Ask dad to help with the paint and the frame to keep it a surprise. Every good mom deserves a good brunch. Make something special for your mom on Mother's Day! Make sure she gets her meals covered on her special day. Toddlers can participate in the crafting, too! Creating handprint mugs is one of the super easy homemade Mother's Day gifts the little ones can make for mom. Here's something beautiful that'll surely touch her heart. Almost all moms are sentimental. Print out this tree, and make it a thumbprint family tree. This will look great on the fridge or anywhere you can put them on. Personalizing these DIY magnets by placing pictures of you and your mom makes this one of the memorable homemade Mother's Day gifts. Make your mom feel special with this DIY paper flower corsage. How touching it is to give your mom the corsage of love and care! Give her lovely memories she can always see in the kitchen. This will inspire her to cook and prepare food with love and care for the family. Make these adorable little sachets and bean bags that will hold so many memories! She will love to see these around the house. Does your mom love to cook? I'm sure there are always new recipes she loves to try. So, make this recipe holder for her. Remind mom how truly awesome she is with this DIY wall art. Seeing this on your wall every morning will brighten up her day. It's never enough to just have photos on the bedside table; it should also be on a lampshade! Allow her to reminisce those beautiful memories with the family before she sleeps. Are you up for a little sewing project? Make your mother a beautiful clutch! This polka dot and leather fold-over design is going to be a surprise she will love. This is something any mom would cherish forever. Even the kids will have a great time making this Mother's Day gift. I'm sure you feel the same way about your mom. Make this board as one of the precious homemade Mother's Day gifts for your mom and let her feel the love and care you have for her. Give your mom more reasons to take it easy and have a little rest. She deserves to have a break too with this blanket! Give her something to imagine how comfy your gift is just by looking at it. Here's a great DIY project where you can have your favorite photos not just on your phone but on your phone. Customize her phone case and surprise her with this on Mother's Day. Moms need a little treat, too. You should know what simple treats make her mouth water. Make her this edible bouquet! Surprise her with a jewelry box with some handmade Mother's Day jewelry. She'll surely love it more than those expensive, store-bought ones! Any mom would agree this is the best gift basket for Mother's Day! Her favorite wine and some of her favorite chocolates in one basket is a smart way to tell her to take a load off! Mom will cook more when you give her this beautiful apron. She'll try to become the best cook for the whole family. If you're having a hard time saying you love her, try to write it down. You'll even make it more unique by writing on the playing cards. With these homemade Mother's Day gifts and ideas, you'll never run out of beautiful gift artworks for Mother's Day. Despite that, there are still many more brilliant gift ideas you can explore for this special occasion. 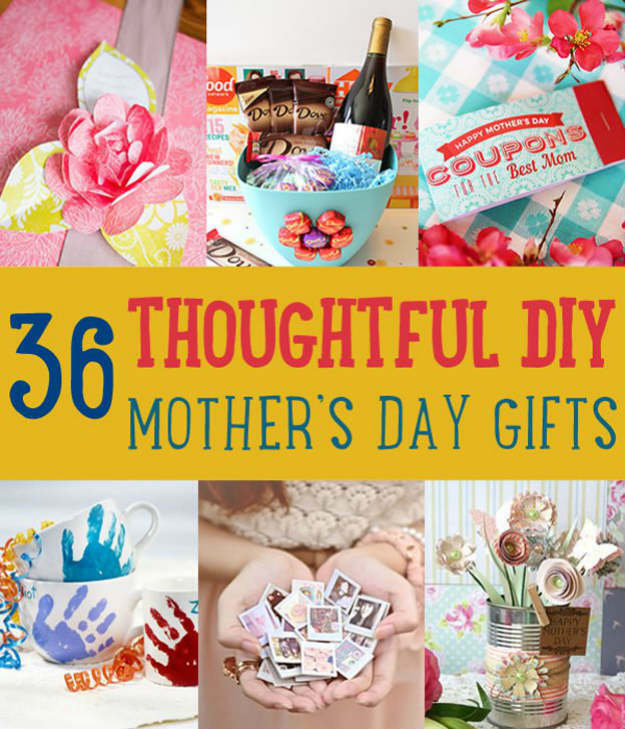 You only need to let your creative juices flow to come up with wonderful Mother's Day gifts. So, start making your gifts now and make the most out of them! Did you enjoy our list of homemade Mother's Day gifts? Share your thoughts with us in the comments section below! Editor's Note: This post was originally published in May 2017 and has been updated for accuracy and relevancy. I can’t get #19 tree to download. What am I doing wrong?